Ice creme themed activity where students match the words on the scoop to the correct sundae. Recording sheets and worksheets included. This I Have, Who Has game can be used to reinforce the differences between the soft "c" and hard "c" sounds in words. I have included two versions of this activity - a color and a black and white option. 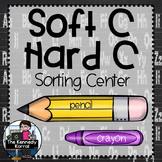 Soft C, Hard C Word Sort Activities!!! 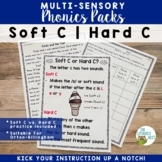 Students will read different C words then decide if the words have a hard c or a soft c. Included are directions so that you can play as a whole class, a small group or partners, or individually. Use this file to help students understand when C sounds like /s/ and /k/. A word sort is included to help students practice this skill. I have also included a rule poster that goes along with the hard and soft C sound. 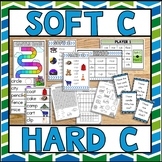 Directions:Lay the header cards down for Soft c and Hard c. Sort the words cards into each category. Then write your answers on the answer sheet. Check your answers with the answer key.Like this? Check out all my other Card Games! This is a no prep, print and use activity! It includes two sorting mats and 16 pictures. Print the whole thing for a quick station activity, or print just the pictures for an easy journal activity! This worksheet won't just make your kids to decode Soft C and Hard C sounds in sentences, but also encourage them to have a communicative practice with their friends. Isn't it amazing? A SMARTBoard phonics lesson for the hard and soft g and c sounds. Includes the phonics rules and 2 sorting games! Anchor Charts for Hard and Soft C and G, and the /k/ sound at the beginning and end of words. Word sorts for Hard and Soft C and G. Worksheets and word sorts for the /k/ sound at the beginning and end of words. A soft c, hard c, soft g, hard g song to help students remember the rule.